Everyone knows Krispy Kreme for their doughnuts. Coffee? Not so much. 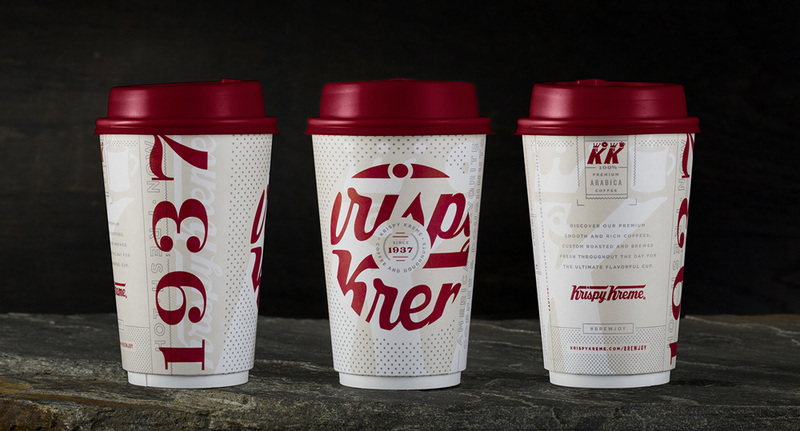 Even though it's been part of their brand since the beginning, Krispy Kreme approached Device to help re-introduce their coffee beverage platform to consumers by re-designing their iconic coffee cup. 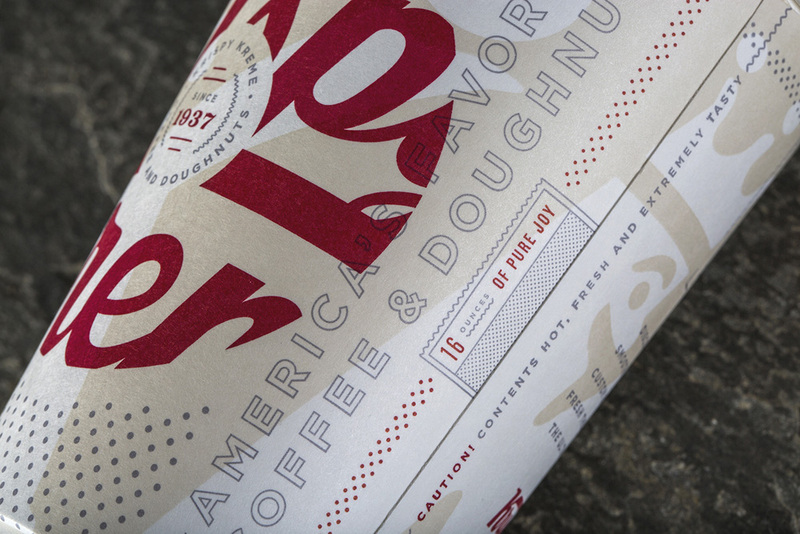 They had re-formulated their entire coffee platform to go perfectly with their doughnuts, so wanted to move away from the dominant green and big logo for a distinctive approach that would signal to the consumer that their coffee was new and different. The design objective for the cup was to communicate 5 things: coffee, premium quality, fresh, authentic and crafted. The cup also needed to work on its own while relating to what everyone already loves about Krispy Kreme: their delicious doughnuts. Since many people order their morning coffee through the drive-thru with only that one touch point to the brand, we decided to tell the story visually and verbally. 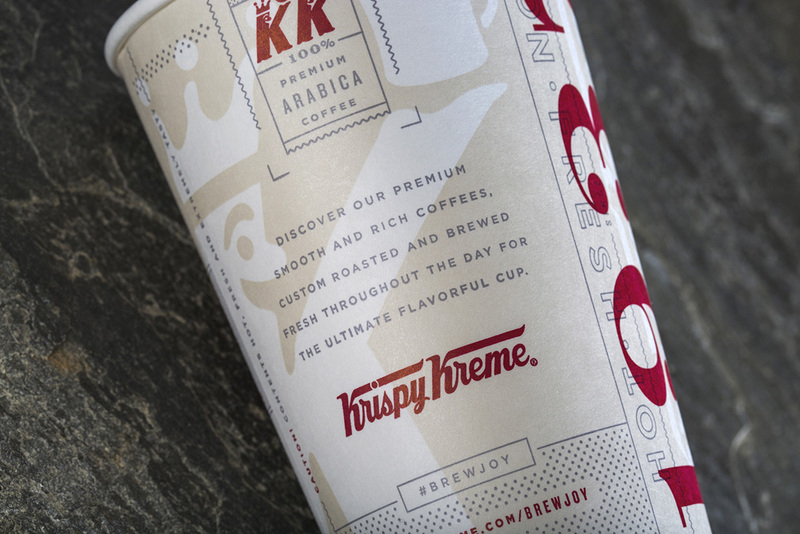 Our solution was to incorporate elements from Krispy Kreme’s 80-year heritage, bringing authenticity to more than just their doughnuts, and create a fun experience that would get noticed by consumers and entice them to switch their coffee preference to Krispy Kreme. The cup from three sides. A photo and a video of the new cup from their Instagram account. I do realize this isn’t a logo or identity change and it’s only one element of the brand but when it comes to visibility for certain food chains, their cups are as touchpoint-y as it gets. The old cup was unquestionably Krispy Kreme: it was its signature green and it had the full logo printed across it big and wide. The new cup takes a big risk in eschewing green but tries to make up for it with a groovy design that builds on the history and visual heritage of the company. The design looks great… it’s nicely fuzzed over and layered in a late-1990s cool way but, at least for now, there is no instant “Look, there goes a person with Krispy Kreme coffee — I want that now!”. (Est. 1937) \"Krispy Kreme Doughnuts, Inc., is a global retailer of premium-quality sweet treats, including its signature Original Glazed doughnut. 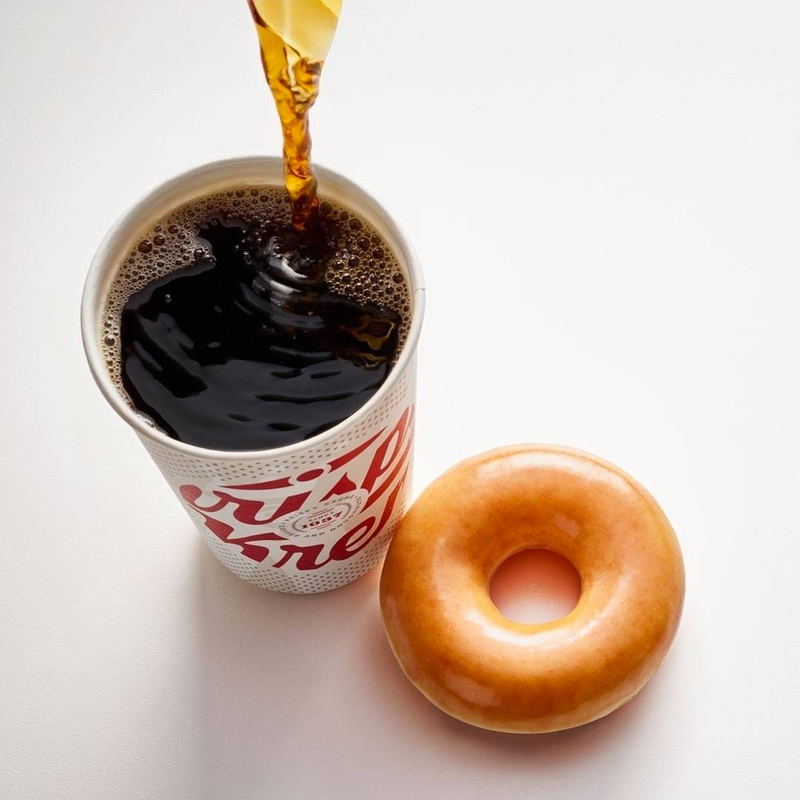 Headquartered in Winston-Salem, N.C., the Company has offered the highest-quality doughnuts and great-tasting coffee since it was founded in 1937. Krispy Kreme Doughnuts is proud of its Fundraising program, which for decades has helped non-profit organizations raise millions of dollars in needed funds. Krispy Kreme doughnuts can be found in approximately 12,000 grocery, convenience and mass merchant stores in the U.S. The Company has more than 1,100 retail shops in 30 countries.\"